James McFadden, who founded Balboa Island and Newport Beach in the 1860s, built Villa Mara on the northwest corner of Altadena Drive and Holliston. The prairie-style estate was built in 1913 for $70,000. 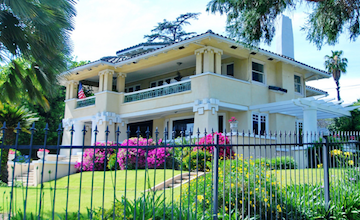 The McFadden family sold the property to "South American Doctor" Dr. and Mrs. J. S. Passeron of Buenos Aires. 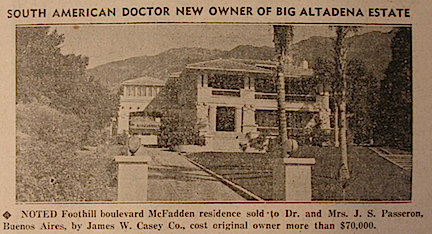 It was listed in the real estate section of The Altadenan June 30 1938. "…Sale of the well known Jennie E. McFadden estate, a large two story semi-Colonial stucco [house] consisting of more than an acre of beautiful landscaped grounds with many rare ornamental trees and shrubs adorning the place."